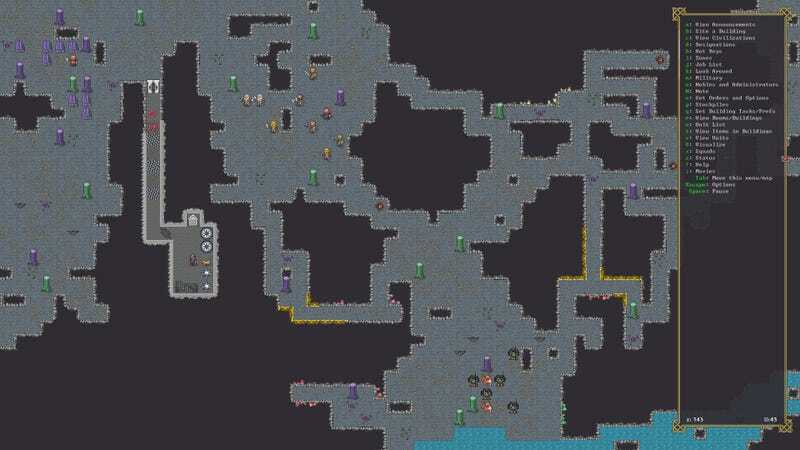 As wonderful a game as Dwarf Fortress is, it’s a shoestring operation—the game is held together with chewing gum and a dream. If you head over to the Dwarf Fortress bug tracker, you’ll see all sort of weird things Dwarf Fortress does to players unintentionally. Due to the nature of the game, which requires a slavish devotion to the small details of dwarven life, these bugs can be hilarious, with players choosing favorite bugs based on their absurdity. In the case of co-creator Tarn Adams’ favorite bug, though, the game provides players with a built-in existential crisis. The myriad bugs in the tracker provide their own sort of entertainment apart from the game itself. “Gatherers get stuck on top of their stepladders and die from dehydration,” one entry reads. That’s right: Dwarves gathering plants from outside would become trapped on the top step of a stepladder and then die there. Older bugs are even funnier. In one, a player realizes that Hydras have both necks and an extra body part called a “headneck.” In the documentation, one person realizes that this has been present in the code since the very first version of Dwarf Fortress, released in 2006, and was only fixed four years later in 2010. When Kotaku asked Tarn Adams what his favorite bug was, he said over email, “I’m so terrible at choosing favorites.” He did say that his brother, Zach Adams, co-creator of Dwarf Fortress, reminded him of a bug from the game’s Adventure Mode, where you can take a character out on a quest. If you’re wondering about the cat thing Adams mentioned, it was a perfect storm of ostensibly unrelated game mechanics coming together: Cats walking through bars would get alcohol on their fur, then self clean, getting drunk in the process, eventually dying from alcohol poisoning. Dwarf Fortress is the greatest game of all time.